Made a half batch of Ellie Krieger's Banana Pecan Bread with a little twist to it. I made it in muffin papers and adapted the recipe a bit. The original recipe asks you to spray a loaf pan with cooking spray. I don't think we have cooking spray here in Japan. Plus, I don't think I have a 9 x 5-inch loaf pan. I also used olive oil instead of canola. Anyway, instead of 4 servings (half of the original 8), I got 6. Banana Pecan Bread Muffins adapted from Ellie Krieger's "Comfort Food Fix"
Put all the wet ingredients in with the mashed bananas and mix well. Bake in a 350F (180C) oven for about 25 minutes or until the top is brown and a toothpick comes out clean. 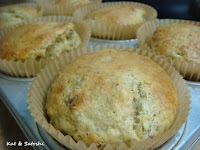 NOTES: I liked this, moist and sweet from the bananas, not much to clean up too...I'd definitely make this again...muffin style. 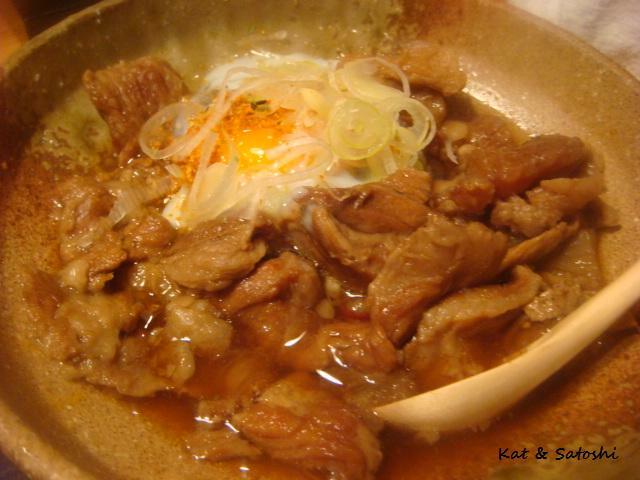 Tokumasa is well-known in Osaka for their curry udon. I was looking at their website recently and noticed that they also have shops that just serve curry and rice. Saturday's lunch was at Joto Curry. Joto means superior, first class. The shop we tried in Whity Umeda only has counter seats. Buy your meal ticket at the door, hand it over, then sit wherever you like. 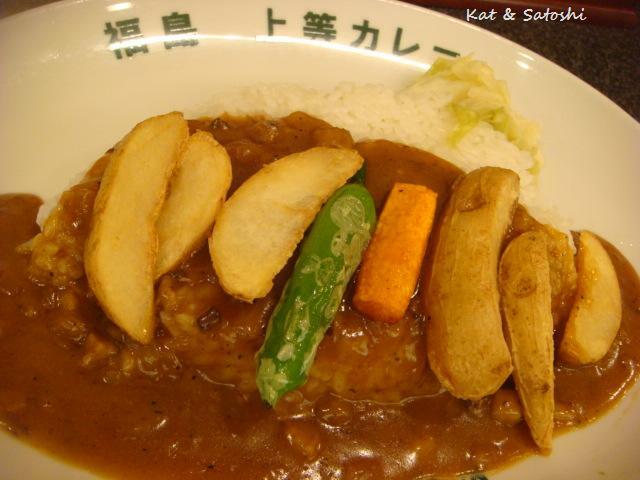 Satoshi tried their potato curry. This was their curry with french fries (and a little bit of veggies) on it. 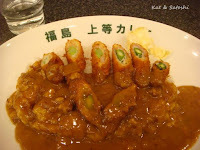 I tried their curry with aspara maki (asparagus rolls). The asparagus is wrapped with a thin slice of pork then fried. Because we already liked their curry served as curry udon, on rice is just as nice. The pickles on the side tasted just like Japanese cole slaw. Lately I've been walking towards Ikeda which takes about 30 minutes from where we live, and is a little over a mile. I walk that way because the route is relatively flat and there aren't many traffic lights. 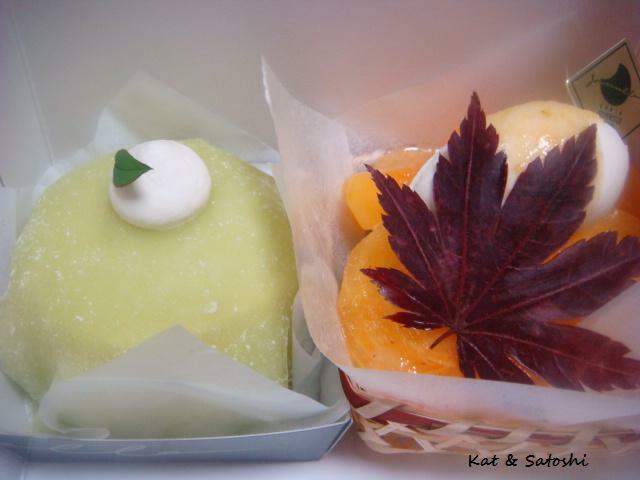 There is a tiny shop in their shopping arcade that caught my eye...one selling sweet potato treats called Ikeda Kintoki. I bought the plain "sweet potato". The Japanese literally call this "sweet potato" because of the shape of the treat which looks like a sweet potato. It is made by combining sweet potato, sugar, eggs, butter and cream...really rich which is why they are only about two inches in size. Delicious and only 100 yen a piece. 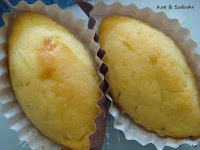 "The Kintoki" a sweet potato an pan...soft buttery brioche bread filled with sweet potato paste...only 130 yen a piece. They don't skimp on the filling which is a good thing too. My only peeve with this place was the hygiene...the grandpa baking had a lit cigarette in his mouth as he took stuff out of the oven and the grandma at the counter was eating something when she helped me and was chewing away as she talked to me...I'll be back (maybe). I know Satoshi tries his best when it comes to pronunciation of words in English, but sometimes it is just so funny what he hears and what he says. Once we were talking about Victoria's Secret and he said they sell "blahs" yeah?! I said, "bras", he said, yeah, "blahs". 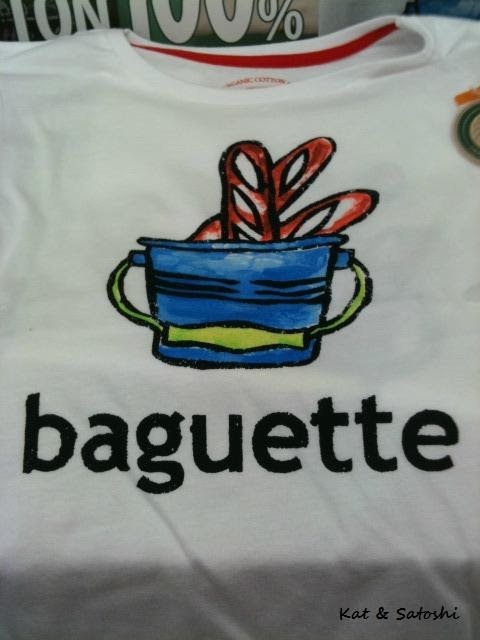 The funniest was when I was talking about "baguette", you should know that most Japanese call "baguette", "france pain (pahn)" and don't call or know it is called "baguette". 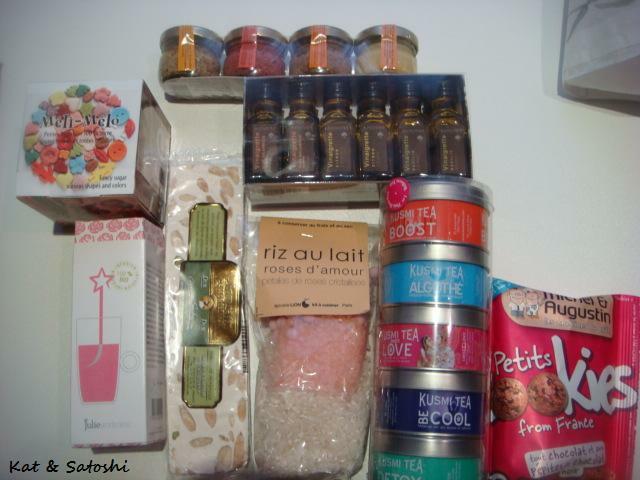 Tuesday was Ii fufu no hi, Satoshi brought home some sweets from Jouvencelle. 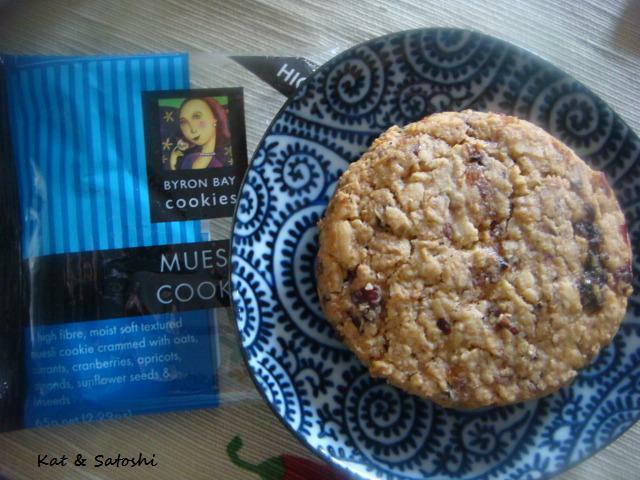 Both were delicious, thank you Satoshi! 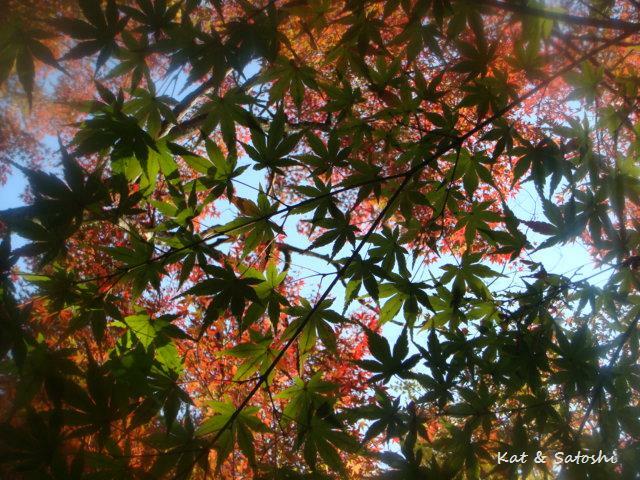 The weather was forecasted for rain, but the autumn leaves were apparently at its peak...what to do?! 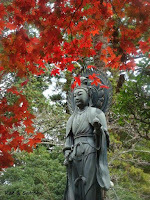 Since we woke to a rather sunny morning, we got out and about early and walked to Saikoji. 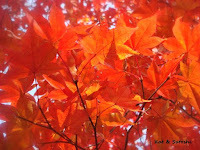 It was a mixed bag, some trees were bright red, others were still green. Kinda weird this year probably because the weather has been weird. 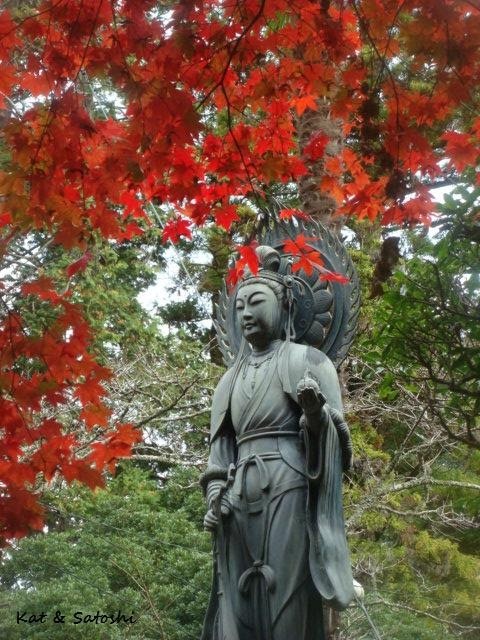 Some of the trees around the Kanon at Benzaiten, had turned red, but for the most part everything was still green. We walked to the falls but were very disappointed because all the trees around the falls were still green if not brown...boo! To "cheer" ourselves up, we decided to have some coffee and something sweet and popped in at Hashimoto-tei. I tried their buttercream cake. 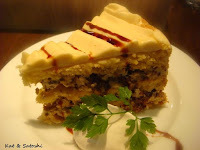 I didn't see the small print in the showcase which said "rum raisin"...the cake was filled with rum soaked raisins...which totally over-powered the whole cake, you couldn't even taste the buttercream...blah. Satoshi still hungry after his cheesecake and coffee, decided to try the yuzu croquette. 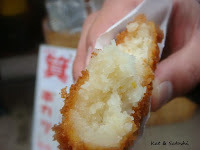 It was good, there were bits of yuzu peel here and there, but the majority of the croquette was potato...130 yen. 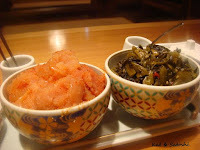 For dinner, I made some kinpira gobo and spinach goma-ae. I also used some leftover boneless fried chicken sticks to make some "sushi". 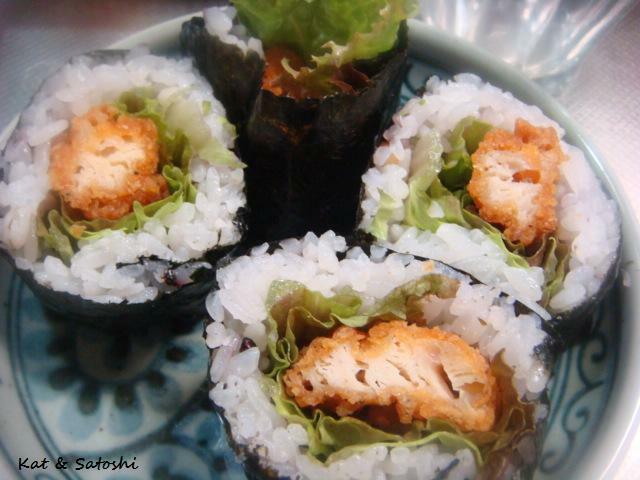 Just nori, freshly cooked rice, lettuce and chicken...no other seasonings. 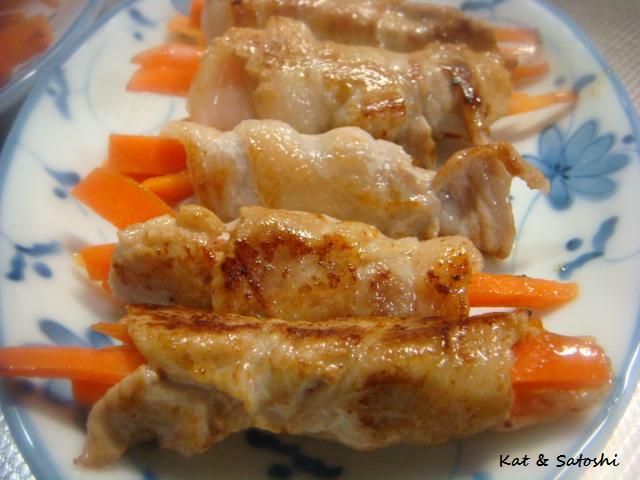 We dipped these into a tonkatsu-mayo sauce. 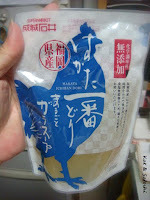 Again, Satoshi, who doesn't care for chicken, gave it a thumbs-up! Thursday the weather turned wintry...the wind was icy. Thank goodness the sun came out for the most part of the day. Dinner was a repeat of savory mille feuille...this time I added eringi, gobo and eggplant to the pork and chinese cabbage. 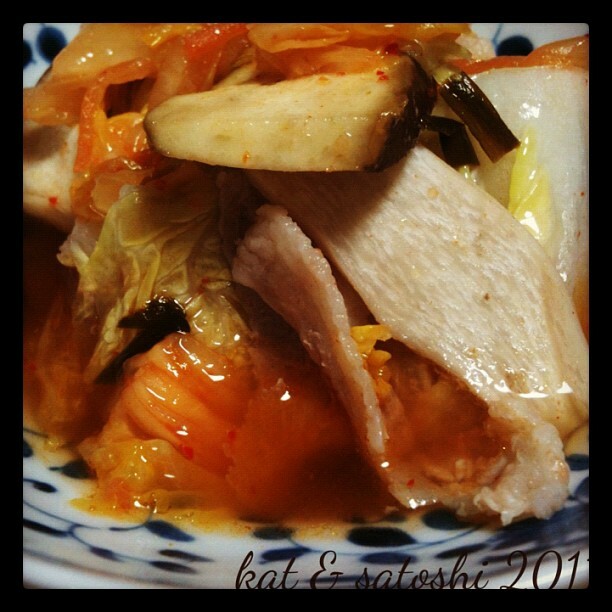 As well as kim chee. There is a dish that Satoshi and I like at Capricciosa, their tuna and ika (squid) salad. The ika (squid) is boiled and the tuna straight from the can, placed on top of some purple cabbage and lettuce. I found the recipe for their dressing online at Cookpad.com, it's really close to the real deal. NOTES: I cut this recipe to 1/4 because the weather is getting colder and we'll probably be having less cold salads. I threw everything into the food processor and whizzed it. 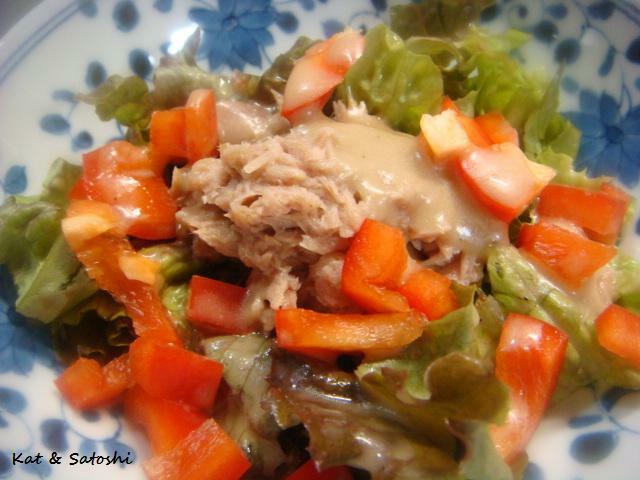 For the salad, I was too lazy to go out and buy some ika (squid), so I just divided a can of tuna and topped the salad with some red bell pepper. Our tuna is only 80 grams, maybe half a can (or less) in the States?! I used the type that is packed in water. 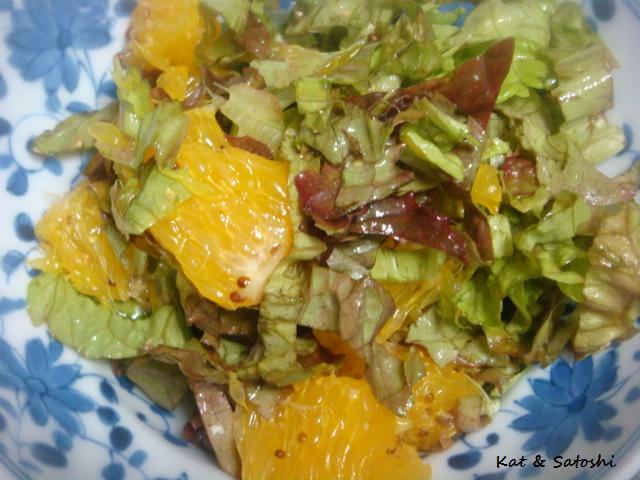 For the dressing I spooned a tablespoon over each salad...it was delicious! 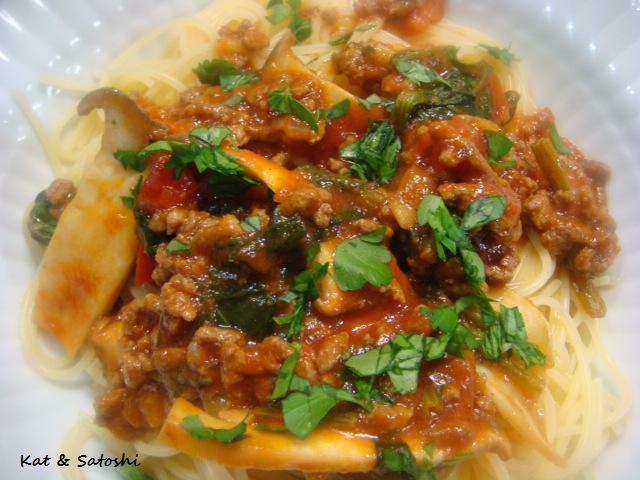 For our main dish, I tried another new recipe from "Orange Page's Yasai ga ippai toreru mainichi no okazu". You know I've had this mook (book/magazine) from 1996 and have slowly been working my way through the recipes. This recipe was so easy, my kind of cooking. NOTES: cooking doesn't get easier than this. The original recipe says to nuke the carrots, but since I try not to use the microwave as much as possible, I just cooked the carrots when I cooked the pork. There was still a little crunch to them, which was nice. I used 1 yuzu for this recipe. Well, it is Friday, boy, did the week fly by. Hope you have a great weekend! Thank you for good health. Thank you for more than enough to eat. Thank you for the sun (and the rain). 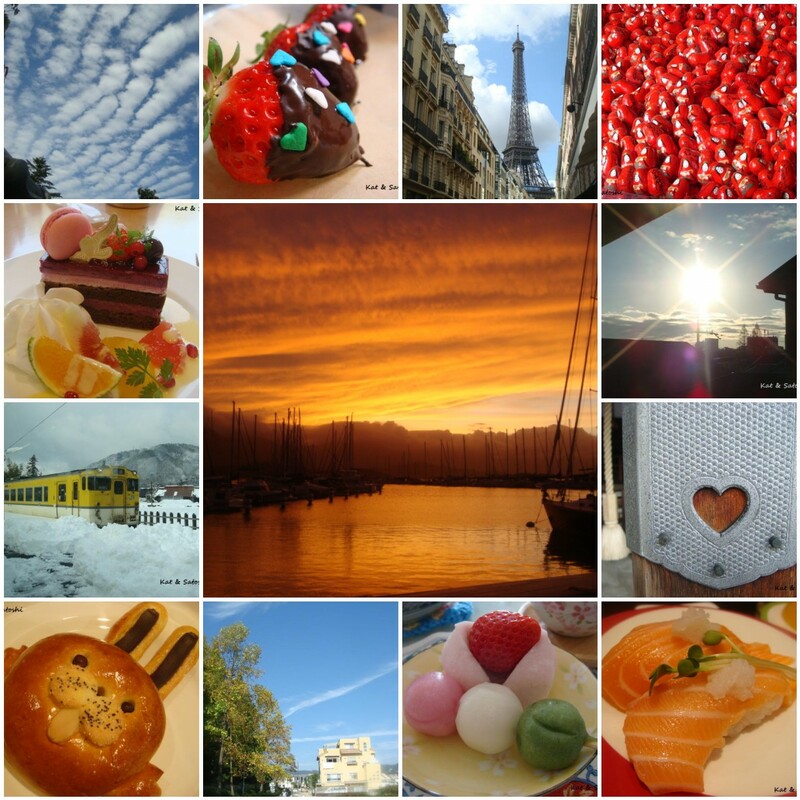 Thank you for family and friends. Thank you for the opportunity to travel. Thank YOU for brightening my day with your comments. Hope everyone in the States has a great Thanksgiving. There is a dish at Capricciosa (a chain Italian restaurant) that I like to get, their spicy eringi ragout with pappardalle. I tried to recreate it the other night for dinner and I think I came quite close. Heat oil in a frying pan and add the onions, garlic and chili. The sauce should start to get thick after a couple of minutes. Cook your pasta according to package directions and drain but do not rinse. Scoop sauce over your pasta and serve. NOTES: I liked this, it was similar to the one at Capricciosa and had more "stuff" in it than theirs. 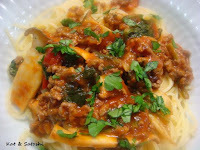 Plus with the addition of eringi, you can cut back the amount of meat you add to this sauce. If you don't have tonkatsu sauce, use worcestershire sauce. 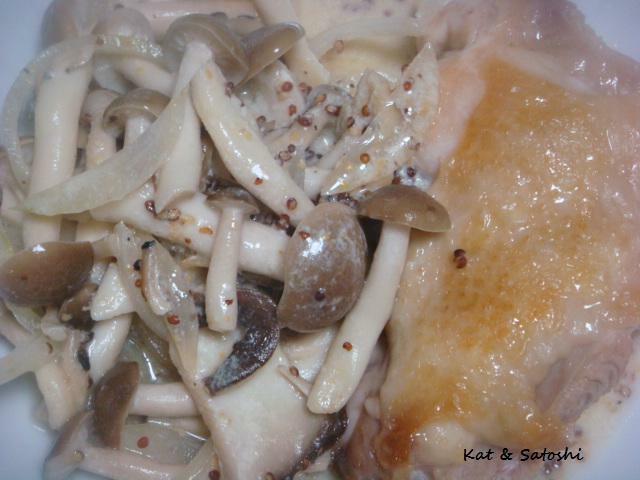 Saturday's dinner was a trial of two new recipes from "Orange Page's Fuyu ni Oishii kondate"
The first was chicken with a kinoko (mushroom) cream sauce. Add the milk at the end, cook until just heated through. Serve with your favorite roll or bread. NOTES: This was easy and delicious. 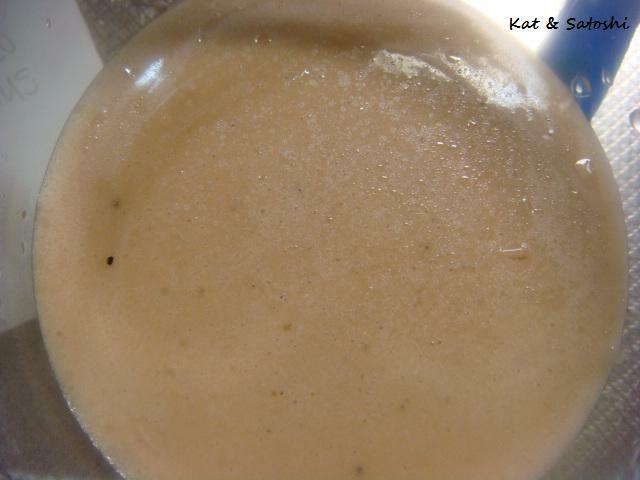 The original recipe called for cream, but I lightened it up by using skim milk. I think this mushroom cream sauce could be used on other things like fish. 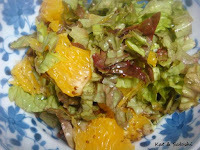 Another dish I made was a lettuce and orange salad. This recipe came from the same book. NOTES: this was refreshing. 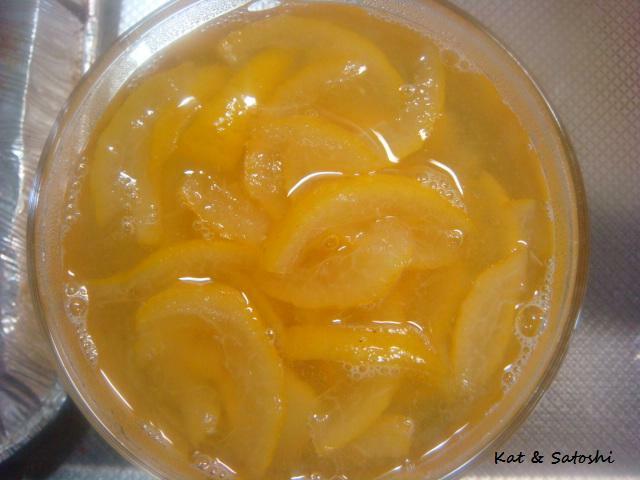 The hardest part was separating the orange from the pith. I threw everything into a ziploc container and shook it to toss. Even though I used grainy mustard in both dishes, each had different flavors. I made the salad a couple of hours before dinner so that the dressing could soak in. The chicken was pretty easy to put together too. 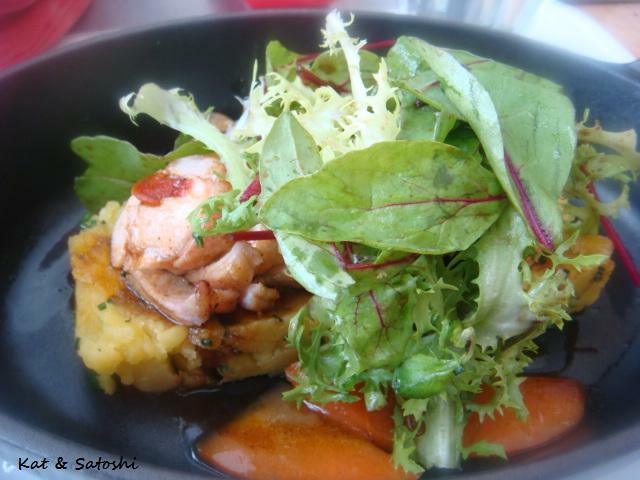 Satoshi, who doesn't care much for chicken, enjoyed this dish especially the sauce. The weather on Saturday was awful. Rained all day, sometimes in sheets even. Satoshi had to go to class, so we had a quick lunch at Mickey D's. Then he went off to class and I stopped into buy some groceries then stayed indoors for the rest of the afternoon. 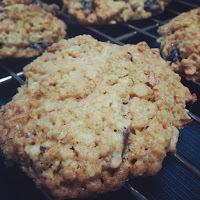 I've been wanting to make cookies, but most times need to cut the recipe into half or fourths because a)I don't have a large oven and b)I don't need THAT many cookies lying around. 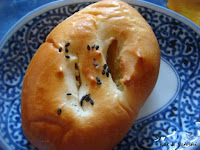 I tried this recipe and cut it into fourths. Add the egg, vanilla and mix well. When done, let cool on baking sheet for 5 minutes then transfer to rack. NOTES: these were good! just amount of chewiness. I ended up with 12 cookies. I'd make these again and it was nice way to brighten up a gloomy day. I recently purchased a copy of Ellie Krieger's "Comfort Food Fix". I haven't "read" through the whole book yet, but since I wanted to make tomato soup for dinner, I flipped through to see if she had a recipe...she did. I didn't follow the whole recipe, just parts. Sweat the onions in the oil until transparent. Add the can of tomatoes, tomato paste and broth. Bring to a boil then bring down to a simmer. Add milk, sugar, salt, pepper, thyme, mix well. NOTES: the original recipe called for chives, cream and garlic. I thought adding garlic would be a little too strong a flavor, so I left it out and added thyme instead. I didn't want to go and buy cream, so I subbed skim milk. And I didn't have chives so I used Italian parsley instead. I liked how easily this soup came together and it was tasty too. 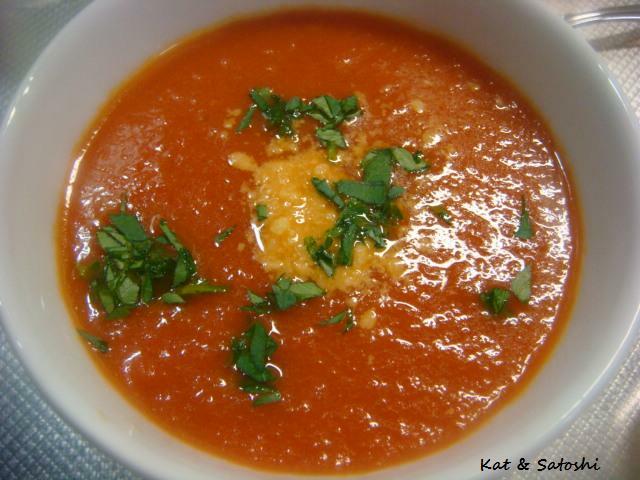 I'm making this again and I'm also sending it to Deb's Souper Sundays. p.s. I know I said that you can't find chicken stock in Japan but I had forgotten about the chicken stock at Seijo Ishii (gourmet supermarket), they sell them in 1 cup sizes for 250 yen. 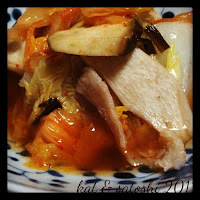 In Japanese it is called "torigara soup". I was hoping to buy a couple of jars of yuzu marmalade, but I think I'm a little too early in the season because I couldn't find any around the Minoo station area. 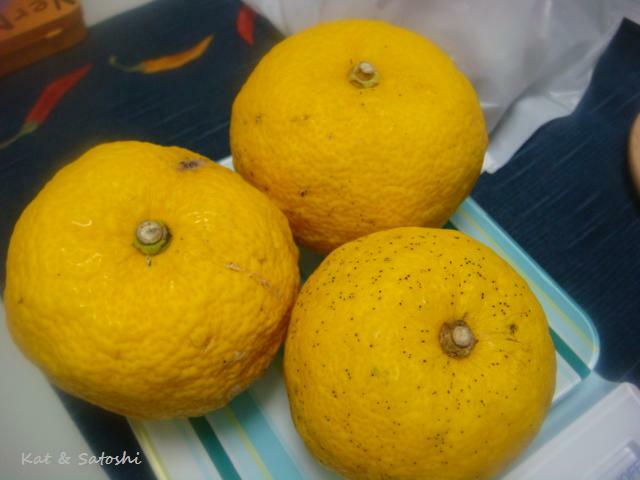 I did come upon a vendor selling 3 yuzu (citron) for 150 yen (there was another vendor selling 1 yuzu for 100 yen! ), so I bought some and decided to try making some myself. 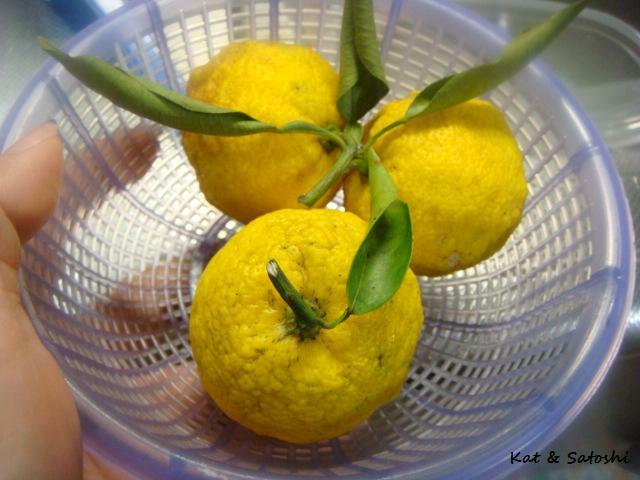 The skins on most of these yuzu were speckled, so I only used the true yellow parts. 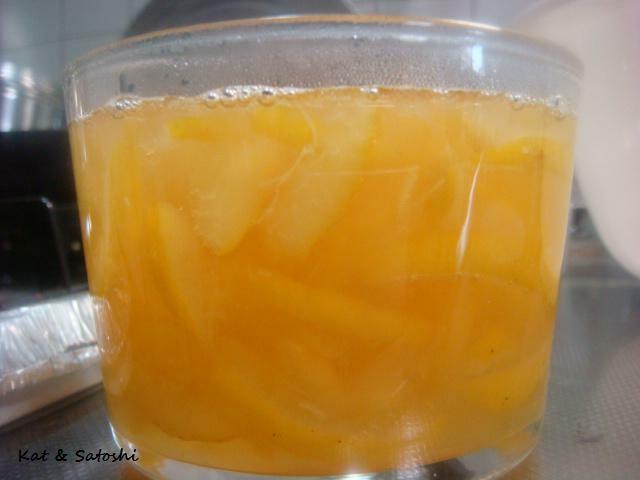 I squeezed the juice from the yuzu then from the peel, scraped away some of the pith. Then I sliced the peel. After slicing, I weighed the peel then measured the same amount of sugar. In a pot, I added the peel, sugar, 2 cups water and the juice of the yuzu and brought everything to a boil. While it was boiling, I scraped away the scum. When the mixture started to evaporate to about half, the scum weaned and it was ready. I think in the end I ended up with about 1 cup of marmalade. A little bitter from the peels, but this is gonna be nice as yuzu tea or as a topping for yogurt. Yesterday, Satoshi had the day off so we went to see "Moneyball", a great look at the financials of baseball. Afterwards we had lunch and then bought something for snack. 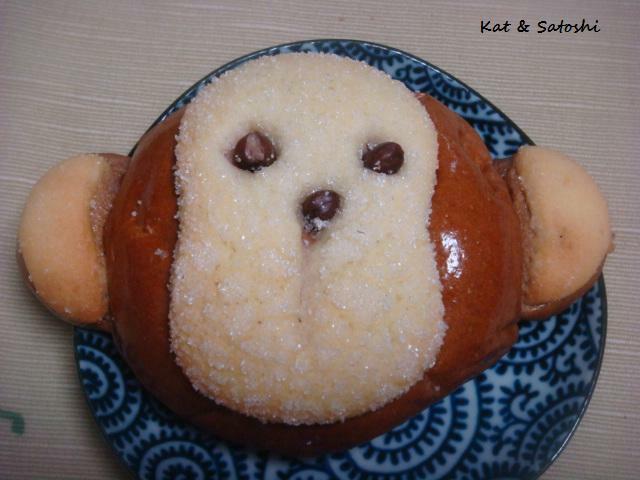 I got this cream bread that looked like a monkey. 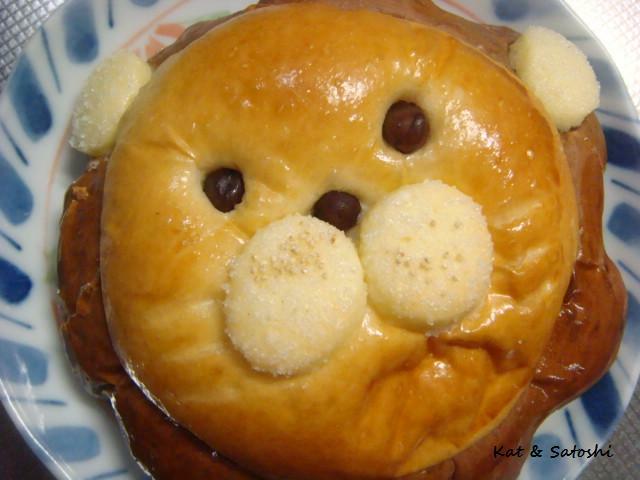 This was from the same bakery I bought the rabbit and lion from. The cream filling was banana flavored and the bread was chocolate...delish. 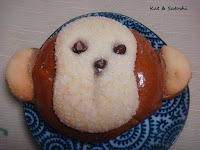 Did you know that in Japanese the monkey says "ki ki (key key)"? What do monkeys say in your country? It is Friday here, we're expecting some rain, hope you have a great weekend! Remember those True North almond pecan cashew clusters I told you about? Well, there were a lot of "crumbs" at the bottom...about 1/4 cup worth, that I couldn't see throwing away. 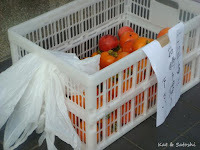 Then over the weekend I watched, "Kamome Shokudo" a quirky Japanese foodie movie set in Finland. The main character opens a cafe in Finland and the adventures begin. 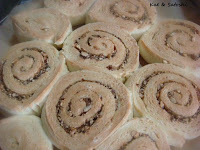 During the film, one of the items she makes are cinnamon rolls. I made some glaze with powdered sugar and some water and drizzled it over. 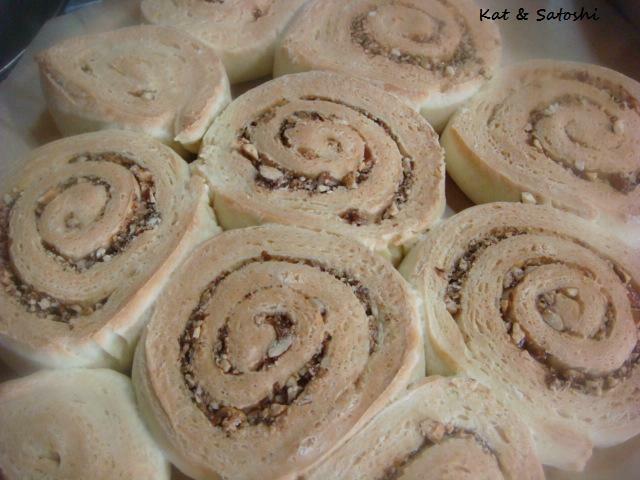 It was my first time making cinnamon rolls, they don't look as fabulous as the ones in the movie, but straight out of the oven they were delicious with some coffee and it was a nice way to use up those "crumbs" (and that expired yeast). UPDATE: the next day they were a bit dense, probably because it didn't rise well to begin with, but still tasty all the same. Tuesday after French class a handful of us went to lunch at Benoit. They were having a food event called Fou de France (Food of France). This event was started by Alain Ducasse in order to showcase the chefs who have restaurants in regional France. The chef who would be cooking for us was Xavier Isabal of Hotel Ithurria, a farm hotel that has been around since 1657, located in Ainuhoa, Basque. 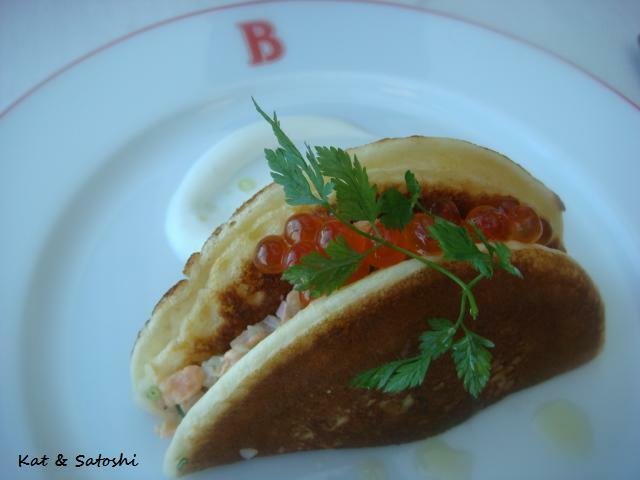 Our lunch started out with a blini topped with salmon roe and filled with smoked salmon. I liked this but there were passion fruit seeds here and there and the crunching made me think there were bones or something in there, I would leave out those seeds next time. 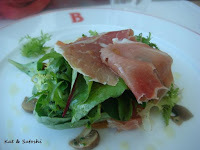 I really enjoyed the crispy potato wafer and the homemade ham was very tasty. I figured how often would I be able to eat rabbit? especially in Japan? 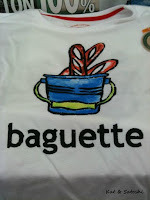 cooked by a chef from France? 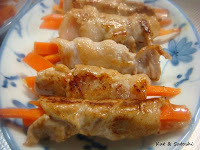 The texture was similar to chicken, very moist and tender, no gaminess to it. Dessert was coupe Stéphane, chocolat chaud (vanilla ice cream, topped with whipped cream, hot chocolate sauce and almond bits, the mushrooms are made of meringue) I had envisioned something "molten" so I was pleasantly surprised when this came out. They bring it out and drizzle hot chocolate sauce over it. 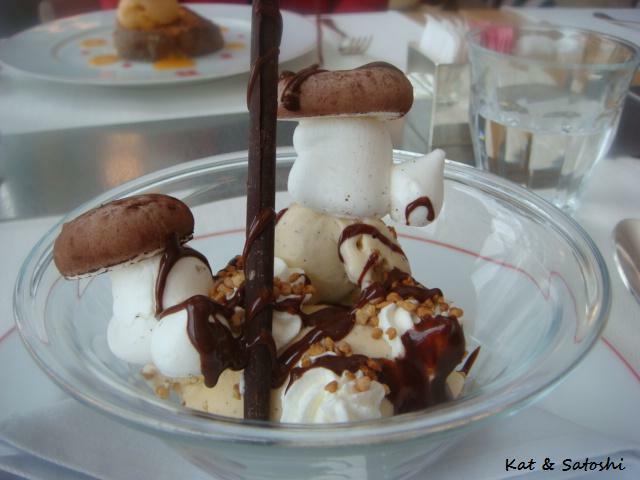 The mushrooms are made of meringue and are very light. It had the right amount of sweetness, the perfect ending. 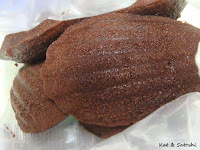 We also each received a bag of chocolate madeleines to take home...delicious! 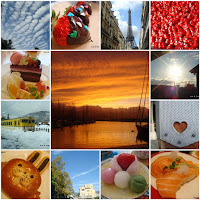 A great foodie day, I hope my French classmates invite me out with them again it was fun. Did you know that Sunday was World Kindness Day? I didn't. 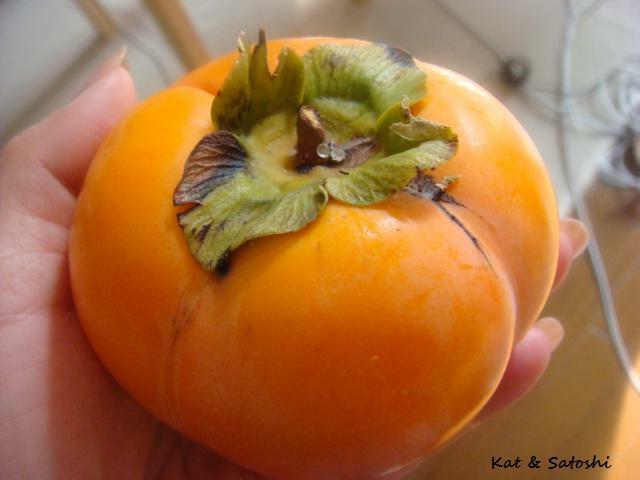 On Monday, I ran into some kindness...a person had a box of persimmons sitting at the front of their house with a note..."please help yourself". I've not seen this around our neighborhood much, but thought it was nice of them, so I took one. 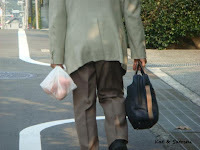 Another man, who bypassed me while walking had taken three. The persimmons were quite large. 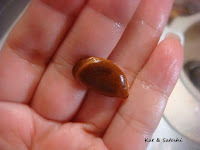 I think I've said that the savory rice cracker called "kaki no tane", is named so because it resembles the seed of the kaki. 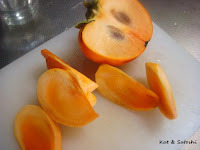 Peel the skin and take out the seeds. This one wasn't too sweet but it was a nice treat and a nice act of kindness...Gochisoosama! I made a batch of coconut pearls. When the liquid was still warm, I made a serving of Che Chuoi...yum! After that, we had several servings of cold che chuoi, and then I threw the remaining 1.5 cups of the sugary coconut pearl liquid into my ice cream maker to make coconut sorbet. 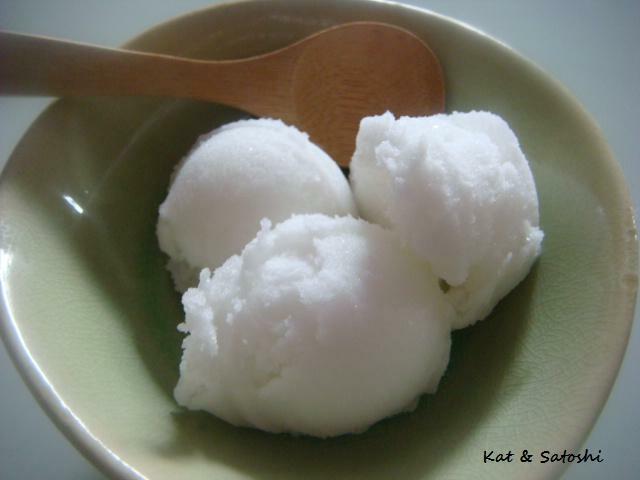 After taking it out of the freezer, I had to wait almost half an hour before I could scoop it, but it was delicious. The weather is still weird here, cold hot cold hot...I was even feeling a little under the weather the other day because of it. Feeling much better but definitely need the sun to generate some mojo. I heard about this place, Yamaya, and was interested in having Satoshi try this place out. He ordered the gyusuji nikomi (simmered beef scraps)...980 yen this comes with a soft boiled egg, a salad, a big bowl of rice and miso soup. The meat wasn't the best of cuts so it was simmered for a long time and you can tell because it was so tender and flavorful. 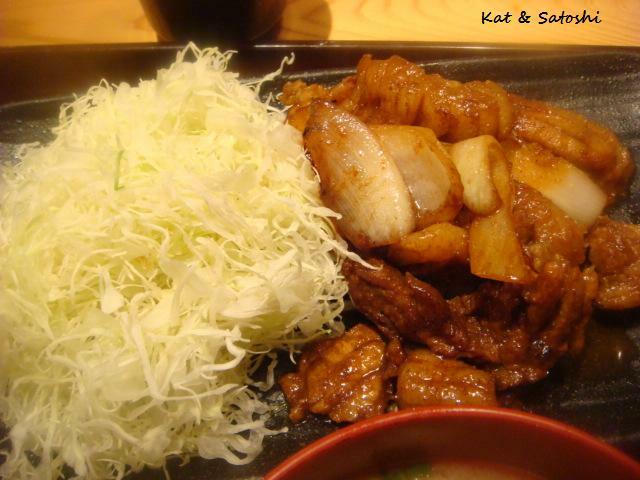 I ordered the buta shogayaki (pork ginger)...980 yen. This came with a salad, lots of shredded cabbage, miso soup and a big bowl of rice. The pork was tender and very flavorful too. 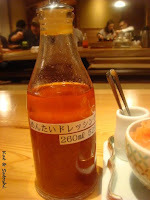 For your greens, use the mentaiko (spicy pollack roe) dressing. I thought it would be "fishy" tasting but there was a lot of citrus in there and it was delicious. The reason why I wanted Satoshi to try this place is because he loves mentaiko. 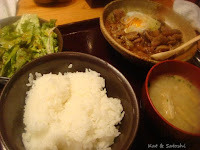 They have a bowl of mentaiko and a bowl of takana tsukemono (pickled chinese mustard cabbage) in the middle of the table, which you can take as much as you want to eat with your rice. This place doesn't have many seats, so you have to share your table with others, this is called aiseki (eye-say-key) in Japanese. 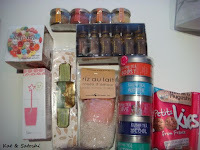 If you take a look near the left corner of the photo there is a box of sugars. 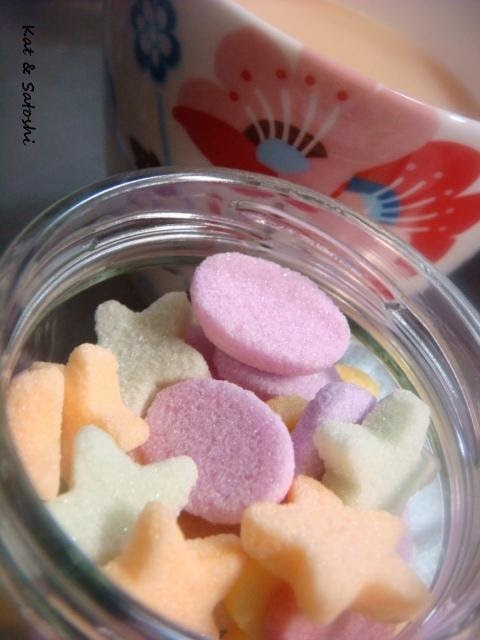 Belle de Sucre, has an assortment of sugars called Meli-Melo. I opened this box of sugars and was surprised, it was only held closed by a piece of plastic around the box. These are cute and colorful. 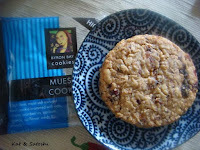 Byron Bay's muesli cookie..."crammed with oats, currants, cranberries, apricots, almonds, sunflower seeds & linseeds." Soft and moist, this cookie is definitely crammed with "stuff"...delicious. 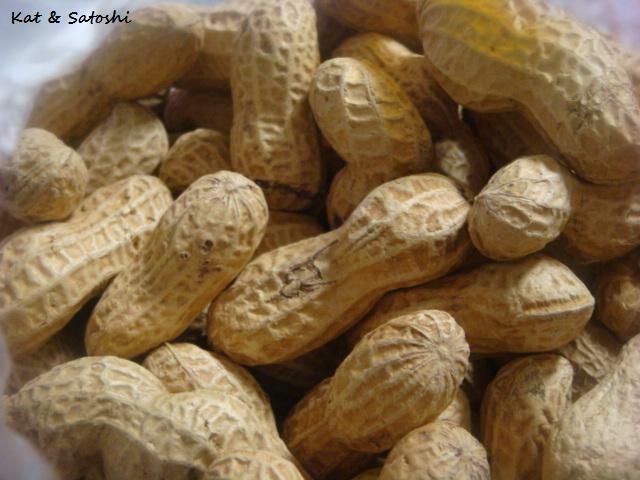 I found a bag of peanuts at the market recently. In Japanese they are called rakkasei. I was hoping they were raw so that I could make a batch of boiled peanuts, but found out they had already been roasted. 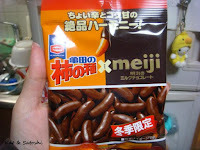 At 200 yen for 300 grams, I thought these were a steal.